A spring company which specializes in the fabrication of torsional springs. The manufacturing of torsion springs is based on the customer’s design which is made to fulfill its function in the spring operated mechanism where it shall be installed. Acxess Spring Company specializes in the production of springs made from round metal wire. The wire is helically wound repeatedly to form the coils that make up a spring’s body. In the case of a torsional spring, the ends of the last coils are straight to form legs. Since we make custom springs, certain modifications can be made to the torsion spring’s legs by bending them the way the customer specified in either a blueprint or drawing. The image to the right shows a few examples of a typical torsional spring with straight legs which measure the same length. You will also see those which have had modifications made to these legs. We have the most advanced and innovative torsional spring design tool in the industry. 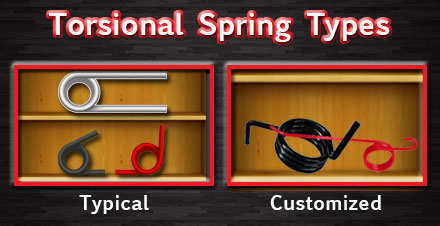 Spring creator is a fast and powerful spring design software which, with only a few inputs, will calculate your torsion spring’s rate per degree as well as your torque tolerances. Our torsion spring calculator will also provide you with a live blueprint of your torsion spring design generated to scale based on the proportion of the spring dimensions you specify like direction of wind, wire diameter, outer diameter, total coils, leg lengths, and even the material type. It is so accurate that the results on rate per degree and torque tolerances are also based on the tensil strength and elasticity of the material type. Review your free position in a section right below step one and make adjustments to it by adding or subtracting a fraction of a coil from your active coils. Now, you may also carry Spring Creator on the go by downloading our Spring Creator app on your smart phone or tablet. You will find it in both Android and iOS. Acxess Spring, torsional springs manufacturer, also sells stock springs. You can find our stock torsional springs at The Spring Store. The Spring Store is an online store where you may search for stock torsional springs using Spring Finder, our torsion spring search locator. The search is based on the tolerances you have on the dimensions (±x). You will input the maximum and the minimum range of dimensions so that the finder will search our catalog and give you the results that stand within those tolerances. Spring Creator is also linked to the the spring store so as you work on your design, you will be provided with a list of suggested similar springs in stock. 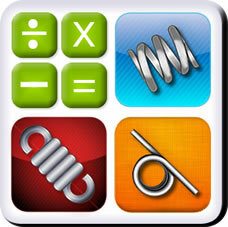 This means that you will calculate a spring design, check similar springs in stock, and buy your springs all in one simple application. Through our site you will be provided with simple how-to-measure diagrams.